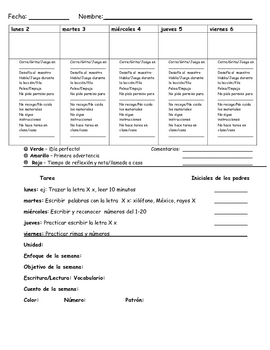 Spanish version of a weekly homework guide to send home to parents. Best for bilingual Spanish classrooms. Contains daily conduct information as well. GuÃƒï¿½Ã‚Â­a de trabajo semanal en espaÃƒï¿½Ã‚Â±ol para padres de niÃƒï¿½Ã‚Â±os bilingÃƒï¿½Ã‚Â¼es. GuÃƒï¿½Ã‚Â­a de conducto tambien.